Calavera de plata vertida a mano Caléndula Monarch Precious Metals de 2 onzas Order your 2 oz Monarch Hand Poured Marigold silver skull from our shop online to enjoy the web's best price. 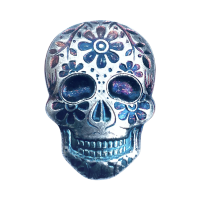 Monarch Precious Metals, renowned for their hand poured and stamped masterpieces, brings you this “Day of the Dead” sugar skull inspired art bar. The top of each three dimensional silver sugar skull is artfully adorned with stylized marigolds and vines, all arrayed symetrically to startling effect. Tonation varies from black and grey to icey blue and even a gorgeous rainbow effect which can be seen within the cast detailing. The base of each skull is hand stamped with the Monarch crown logo. Also on the base, you will find details of metal content, weight and purity. Each art bar is finished with a hand painted antique finish that adds depth and ensures no two skulls are exactly alike. Celebrate Dia De Los Muertos and enrich your holdings with a 2 oz Monarch Hand Poured Marigold silver skull today!